Yes! I love to learn new things, to play, to be a beginner. Why was I creating this pressure to produce? Once I heard that whisper I calmed down, closed all the tabs in my browser and committed to just show up and be a beginner. Since then, I discovered that there’s actually a Zen concept of Beginner’s Mind. It was a fun day of play and more enjoyable for having lost the attitude of being “good” at it. Will I become a printer now? I don’t really think so. It was a fun day but the best part was the reminder to not be afraid to be a beginner. In my photography, while I like being proficient and that is important, I frequently try out new gear or techniques to challenge myself. It’s one of the reasons I like photography so much, there is never an end to what you can do or learn. This is my next challenge below. It’s a panoramic head to more precisely shoot panoramic images. I’m still figuring out how to use it. But I will! There’s much to be gained by the willingness to be a beginner. Have you been a beginner at something lately? This entry was posted in Celebrating and tagged Creativity, Inspiration, Play on February 3, 2016 by gail. Despite the fact that it’s not a Wednesday, I couldn’t resist posting today because it’s the first day of spring! In this part of the world, it doesn’t always look like spring for a few weeks yet, but the vernal equinox is a window of hope that warmer, sunnier days are coming. Spring is my favorite season, with all it’s sense of possibility and potential, so it’s a reason for celebration. Windows are one of my favorite subjects to photograph. Windows are endlessly fascinating and full of symbolism. I pulled some particularly welcoming, spring-like windows from my collection to share with you today and remind you of what is to come. These windows are all in Switzerland where people take great pleasure in adorning their windows with color and pattern and, most often, flowers. This entry was posted in Celebrating, Open to Delight and tagged Flowers, Switzerland, Windows on March 20, 2015 by gail. This entry was posted in Celebrating and tagged Celebrate, Flowers on March 3, 2014 by gail. Last Monday I began a look back at a little over a year of Mandala Monday (MM) posts. This week, I’ll share a few more of my favorites. 7. As I said in #6 last week, I spent several weeks playing with flowers and mandalas. Before I started looking back through this year, I had completely forgotten about this particular mandala but couldn’t resist including it with my favorites. It was the result of a good deal of experimentation and play where I just kept progressively building upon an image and it’s resulting mandalas, One Last Tulip Trial. It doesn’t have as close a touch with the original as many of the mandalas do. You can just barely discern that it began as tulips, but I just love the bright colors. 8. In the Blueberries was a real surprise to me. I did it sort of tongue in cheek, not really expecting anything spectacular from mandalas of blueberries, but those mandalas seemed to touch people in ways I hadn’t imagined. 9. After 7 or 8 months of my regular mandala practice I began to see all sorts of possibilities for mandalas. An evening in front of our outdoor fireplace inspired two weeks of fire mandalas, On Fire and More Fire. 10. Mystery Mandalas had everyone guessing but no one knowing what the source image was. I’d been “playing with my food” on a recent retreat weekend with 2 other photographers and a macro image of a red onion resulted in some richly colored and patterned mandalas. 11. Two separate posts were about existing mandalas that I happened upon: Found Mandalas and Gifts. 12. Into the Forest had some light airy mandalas that, to me, had a very magical quality to them and to which many people responded. That’s just a bit of the highlights of Mandala Mondays. Have I left out your favorite? Let me know in the comments if I have. I’m excited to see what this next year will bring, not only in mandalas but in all things creative. May 2014 be a creative year for you! This entry was posted in Celebrating, Mandalas, Practicing, Seeing and tagged Mandalas, Patterns on January 13, 2014 by gail. October 8, 2012, just a few months more than a year ago, I began the Mandala Monday (MM) series. I was new to blogging and trying to find a way to give myself some structure and accountability. I knew that if I didn’t give myself a reason to write posts, they might never or only sporadically happen. Mandalas seemed a perfect subject for a regular post. One of the many unexpected results (there are always unexpected results) is that creating mandalas has become a practice for me. It has allowed/forced me to experiment with mandala source images that I probably would not have done otherwise. I’m always on the lookout for potential mandala material and some very interesting mandalas have resulted. Some weeks, when I’m particularly busy, for just a split second I think, “Maybe I’ll skip it this week”, but then I remember that there are people who are expecting their Monday morning dose of mandalas. So I show up again to do the practice. 1. The first Mandala Monday explained why I am so drawn to mandalas and featured mandalas created from an image of tree roots. 2. Very quickly, my process changed and the third MM discussed this change. While I had often used images of trees and usually images that were already in my archives, I began shooting images for the potential they seemed to hold for mandalas. This grouping of stones and leaves on a beach created some very interesting and beautiful patterns. 3. Rather simple images of the ice wall inside a glacier from this November post created some surprisingly beautiful mandalas. 4. One of my favorite mandalas of all came from photographing melting ice in my garden, Ice plus Sun. It reminds me of Irish Lace. 5. In an effort to avoid going out in the cold, I photographed stones that I’ve collected from all over the world and that are lined up on my window sills. I found some amazing patterns within those stones, Rock Formations. I’ve used stones again several times to find mandalas. 6. 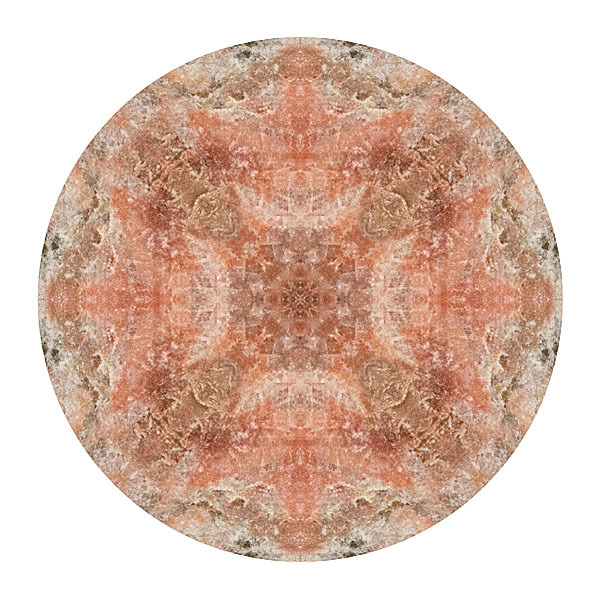 In the spring, I played with flower images for several weeks to find what mandalas might emerge from them. There were daisies, sunflowers, and lots of tulips. This one comment posted for this MM with Sunflowers expresses so well how I often feel about working with mandalas, “It allows me to see the parts of this flower differently and in a new way. It’s like rearranging the furniture in a room and suddenly you see the room, and all the pieces in it, differently and from a fresh perspective.” Yes! Fresh perspective! I’d love to know what some of your favorites have been. Have I left out yours? Please let me know in the comments. I’ll continue next week with six more favorites from a year (and then some) of mandalas. This entry was posted in Celebrating, Mandalas, Practicing, Seeing and tagged Mandalas, Patterns on January 6, 2014 by gail.